Splash pages, you gotta love 'em. A blank canvas where the artist can hit you with a large dose of illustrated 'wow'. For this week's splashie, it struck me I haven't really posted any of the definitive comic book splash pages. So why not start with #1? 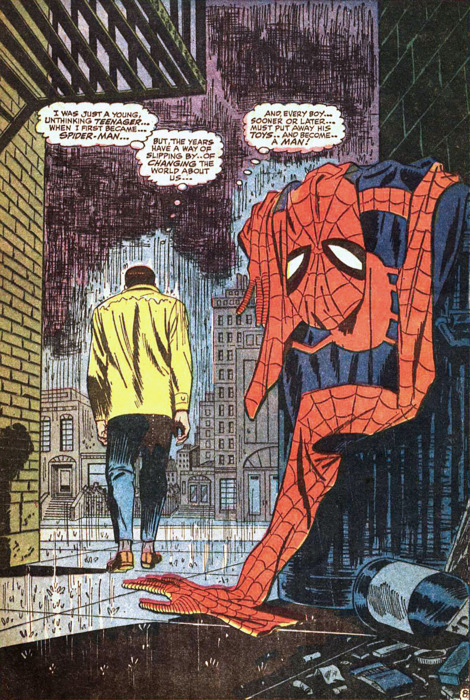 John Romita has to be one of my top three Spider-Man artists ever. 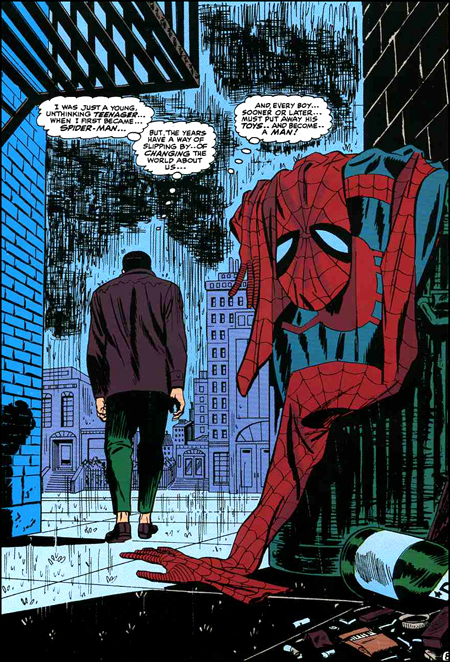 This image of Peter abandoning the reader and the infamous suit so powerful, it not only defines a whole franchise and generation of readers, it set the tone for movie Spider-Man 2 as well. Interesting how in later reprint versions, they re-coloured certain parts to emphasise Peter's blues (What? No one wears yellow anymore?). Me, I still prefer the original from The Amazing Spider-Man #50. Right down to the colours bleeding over the line, it just has that warm homely feel of great comics. 'Nuff said. Now, what would you think if you find that trash can? That sounds like a plot for a Deadpool comic Aliera! Me, I'd probably think Spidey hates swinging round in wet gear as much as the rest of us!